This Model 40T belongs to Bruce Meyer. The 40 was the successor to the Model M. It was produced from 1953 to 1955. You can tell it apart from the Model M because it has the vertical grill instead of the horizontal louvers. You can recognize an "inline" engine with vertical cylinders, and you will not see the flywheel and belt pulley on the side as you see on the other two-cylinder tractors. The other prominent feature for quick identification is the battery cover behind the engine and below the hood. Like the Model M, the "Standard" 40 was made with "fixed width" front end. The 40T is a "rowcrop" tractor that could come in "tricycle" configuration with either one or two front wheels, or it could come with an adjustable width wide front end. See some other examples HERE. There was also a "Hi-Crop" version and a crawler version - the Model 40C. 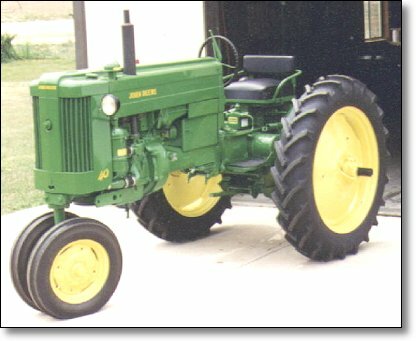 The Model 40 was available in a utility version, similar to the "regular" or "standard" version of the Waterloo tractors. Notice the full width grill. Find out what "Standard" means, HERE. This Model 40U belongs to Bruce Meyer. 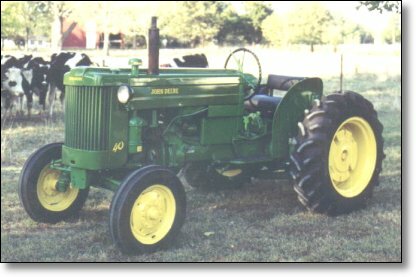 The Model 40 was succeeded by the Model 420, which has the same sheet metal parts, but it is painted green and yellow.